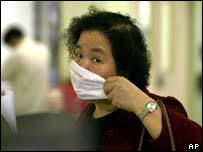 The first case of Severe Acute Respiratory Syndrome (Sars) in India has been detected in the western state of Goa. Indian Health Minister Sushma Swaraj said the victim, a 32-year-old marine engineer, had tested positive for the Sars bug. The victim, who had been discharged from hospital after receiving treatment for fever, has now been quarantined. Until now, India has escaped the mystery virus first detected in Hong Kong last month. It has claimed the lives of more than 150 people since and affected 3,000 people in more than 20 countries around the world. The victim is said to have arrived in Goa earlier this month after touring Hong Kong and Singapore. On arrival he was found to have a mild fever and was admitted at a special Sars ward at the Goa Medical College where he received treatment. His blood sample was sent to the National Institute of Virology in Pune, the main testing centre in India, which confirmed he had the virus. "The sample showed him positive but he is not infected with Sars anymore," Ms Swaraj told journalists in Delhi. "Had his blood sample not been sent for testing he would have never known that he had Sars." Television reports say that both he and his wife have been quarantined. Goa Health Minister Suresh Amonkar has appealed to all those who came in contact with the victim to remain isolated from public places as a precaution. A team from the National Institute of Communicable Diseases will arrive in Goa on Friday to examine the victim and all those who came in contact with him. 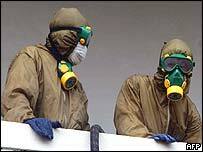 Soon after the outbreak of the mystery virus, the Indian media criticised the government for taking the danger lightly. Media reports said then that passengers arriving at Indian airports from affected countries were poorly screened for the virus. Since then, the government has set up special counters at airports manned by doctors to screen travellers.